You are twice as likely to die if you don’t wear a seatbelt, Cebu drivers and traffic enforcers were told during the Driving Skills for Life (DSFL) of Ford Philippines in SM City Cebu earlier today. Wearing a seat belt reduces the risk of dying in an accident by 50% for front seat passengers and up to 75% for rear passengers, the instructor told the packed room. Everyone has to wear seatbelts because those who don’t are usually thrown off their seats during accidents and can injure or even kill those who buckled up, he said. DON’T USE PHONES, GADGETS WHILE DRIVING. Ford Philippines AVP for Communications EJ Francisco taks about the #ParkYourPhone social media campaign to remind people not to use phones and other gadgets while driving. 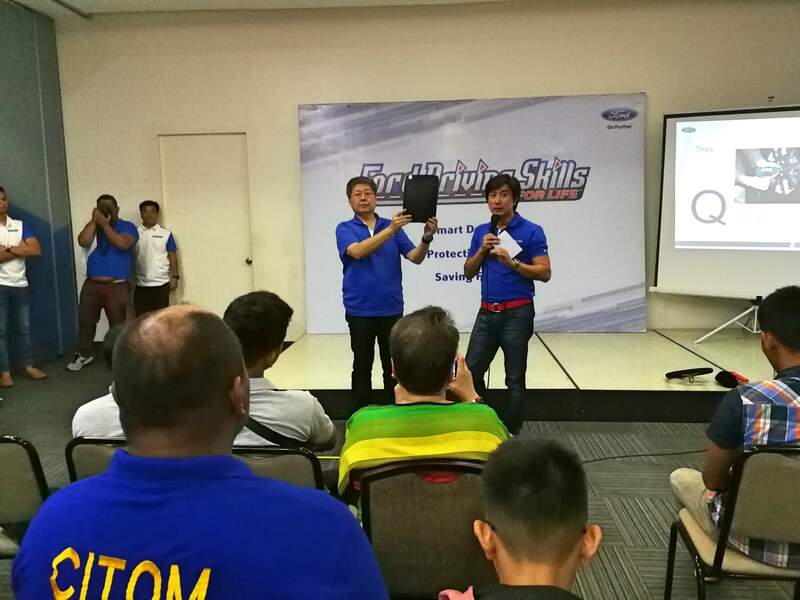 The DSFL “is a global program aimed at teaching drivers the necessary skills for safe and smart driving beyond what is learned in standard driver education programs,” said Ford Philippines AVP for Communications EJ Francisco. Many Filipino drivers and even enforcers do not know existing traffic laws, fail to practice basic road courtesy, and disobey traffic signs, leading to accidents and traffic congestion, Francisco said. Although the DSFL is a global program, it is customized to the driving environment and road condition of the Philippines. It’s long-time partner in the country is the Tuason Racing School. BLURRED VISION. A volunteer struggles to walk straight while wearing beer googles, which simulates the effect of drinking 4 bottles of beer, during a demonstration to show the dangers of driving under the influence of alcohol. The DSFL has classroom sessions and actual driving time to teach attendees safe and fuel-efficient driving. This year, the program added modules on the danger of distracted driving. This is partly to support the implementation of the Anti-Distracted Driving Law in the country, Francisco said. Ford Philippines is also doing a #ParkYourPhone social media campaign to remind people not to use phones and other gadgets while driving. “At Ford, we want drivers to keep their eyes on the road and hands on the wheel at all times because nothing is worth losing that special connection for,” the company said. Since its launch in 2008, more than 20,000 Filipinos have joined DSFL sessions, Francisco said. WHEN TO CHANGE TIRES. Driving Skills for Life Instructors show how to spot indicators on when to change your tires. The program is also expanding to more areas outside Manila.